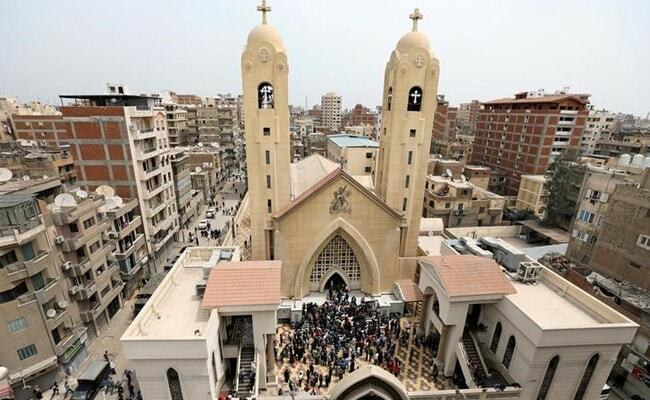 Tanta, Egypt: Bombings at two Egyptian churches killed more than 35 people as they gathered to mark Palm Sunday, officials said, in one of the deadliest recent attacks on the country's Coptic Christians. The attacks on the Mar Girgis church in the city of Tanta north of Cairo and Saint Mark's Church in the coastal city of Alexandria came just weeks ahead of a visit by Pope Francis to show support for Egypt's large Christian minority. Egyptian officials denounced the attack as an attempt to sow divisions in the country, while Francis sent his "deep condolences" to Coptic Christian Pope Tawadros II. There was no immediate claim of responsibility for the attacks but Egyptian Christians have repeatedly been targeted by jihadists including the ISIS group. The first blast killed at least 25 people and wounded more than 70 when it hit the church in Nile Delta City of Tanta, about 120 kilometres (75 miles) north of Cairo, according to a health ministry toll. Images broadcast by private television stations showed bloodstains smearing the whitewashed walls of the church next to shredded wooden benches. The second blast killed at least 11 people and wounded 35 at the church in Alexandria, Egypt's second largest city, according to the health ministry. Tawadros had been attending a mass at the church but a Coptic Church official said he had left before the blast. In December, a suicide bombing claimed by ISIS killed 29 worshippers during Sunday mass in Cairo.